Introducing the new Cubic Zirconia Coated with Nano-Diamond Treatment, that will revolutionize the way we look at cubic zirconia and will most certainly render it obsolete! The patent pending nanocrystalline diamond coating process is used to create Diamond-Veneer - the world's only true duplicate looking of a gem diamond. It is virtually impossible to visually identify Diamond-Veneer as anything but a diamond. The only way to positively identify Diamond-Veneer is by its weight, hardness and chemical component. The index of refraction and dispersion of Cubic Zirconia get modified as a result of the Nanocrystalline Diamond Coating Treatment. The Nanocrystalline Diamond Coating process is the subject of a pending patent in the area of treatment of utility and/or decorative objects with thin film nanocrystalline diamond for the purpose of improving optical and physical properties of materials. 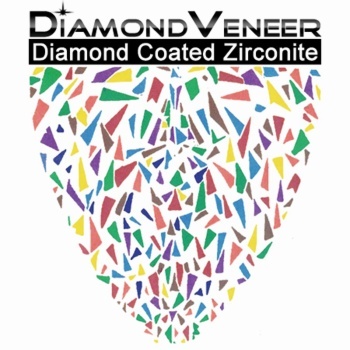 Diamond-Veneer is created by employing a multistep treatment process which involves the application of nanocrystalline diamond particles of size below 50 nm uniformly on all cut surfaces of premium grade white Zirconite cubic zirconia, utilizing proprietary nanodiamond technology. Each Nanodiamond particle is pure diamond with all its optical and physical properties.